In 1950 Livingstone Aerodrome was significantly redeveloped with a fully modernised control tower and tarmac runway, in advance of the emerging generation of jet aircraft. It was proudly reported that the spray from the Victoria Falls could be seen from the control tower. 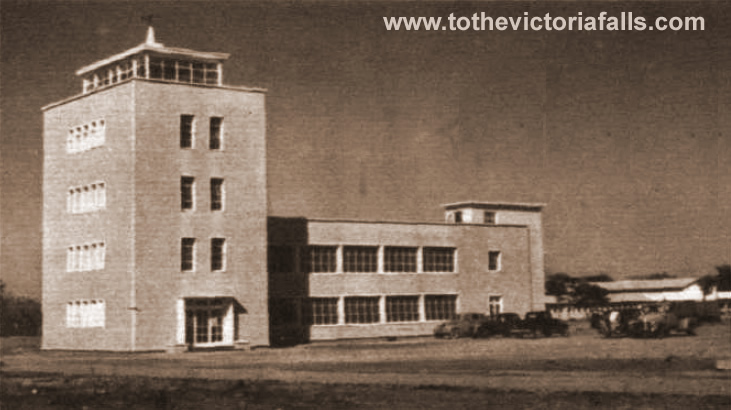 The opening ceremony for the new £1 million facility was performed by Lord Pakenham, Northern Rhodesia Minister of Civil Aviation, on 12th August 1950. Lord Pakenham had arrived, interestingly, by the Solent flying boat service (Stirling, 2014). 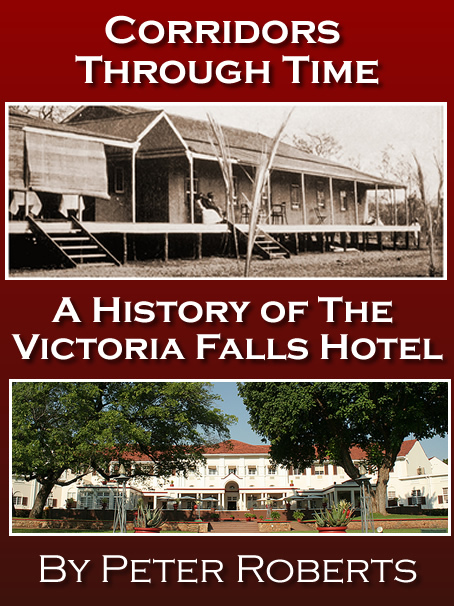 The airport was the main international airport for the region until the opening of Salisbury Airport in 1956, including for tourists visiting of the Falls Hotel, until the opening of the Victoria Falls Airport in 1967. In the same year as the new airport opened, Mr H D Bridge, was appointed Northern Rhodesia’s first Tourist Officer as the country attempted to capitalise on its new aviation advantage. 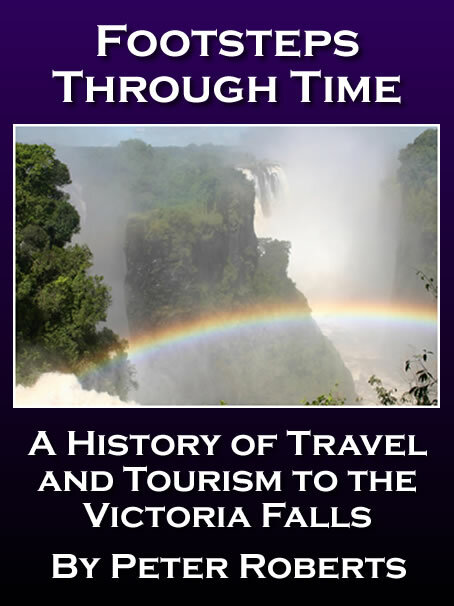 Based in Livingstone Mr Bridge’s brief was to promote the country’s tourism attractions at home and abroad. The growth of long-haul commercial air travel opened up direct, and faster, travel to the Falls, further boosting tourism. For a period all passengers disembarked at Livingstone Airport to stay overnight at the Falls Hotel before either continuing their flight to South Africa or travelling by land to many of the National Parks and other destinations within the region, before the increasing range of international flights shifted the centre of activity southwards to Johannesburg. International carriers serving Livingstone soon included BOAC, Air France and South Africa Airways. The introduction of regional aviation routes, including those of Central African Airways during the 1950s, marked a significant development in tourist travel, breaking nearly fifty years of railway dominance. Despite this, the Falls Hotel continued to flourish during this period. In order to integrate the arrival of passengers on commercial flights, a new railway time-table was released. 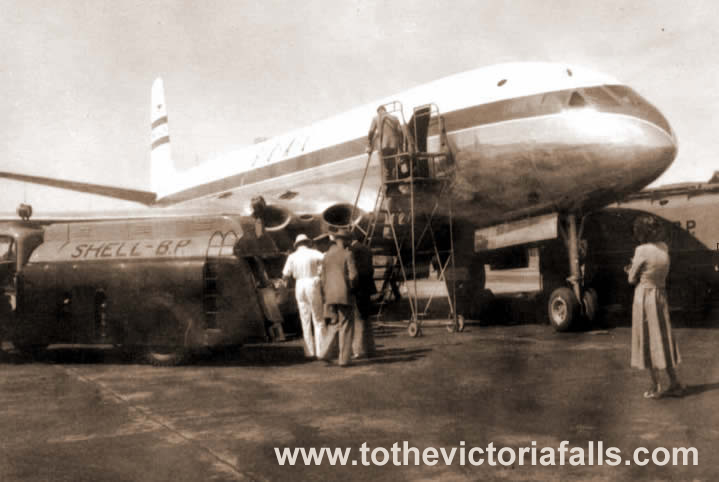 On 2nd May 1952 the ‘Yoke Peter,’ a de Havilland Comet Mark 1, took off from London Heathrow to Johannesburg on the world’s first commercial passenger jet flight, proudly operated by BOAC and heralding the new age of jet travel. The flight stopped for refuelling at Rome (Italy), Beirut (Lebanon), Khartoum (Sudan), Entebbe (Uganda) and Livingstone before arriving in Johannesburg, a distance of 6,700 miles (10,782 km) in 18 hours 40 minutes flying time - and a total journey time of 23 hours 20 minutes. Comet at Livingstone Airport, 1952. External Link: Pathe News Report - On board the Comet. After the war Mr Coleman Myers, from Bulawayo, purchased a surplus Tiger Moth (VP-YJN) and in 1946 started advertising scenic flips at £1 a head. He recouped the £160 cost of his investment in the first weekend of flying. Myers soon purchased a new Piper Cub (VP-YFK) and started his own charter company, expanding his business with the acquisition of Spencer Airways and operating under the name Victoria Falls Airways Ltd. 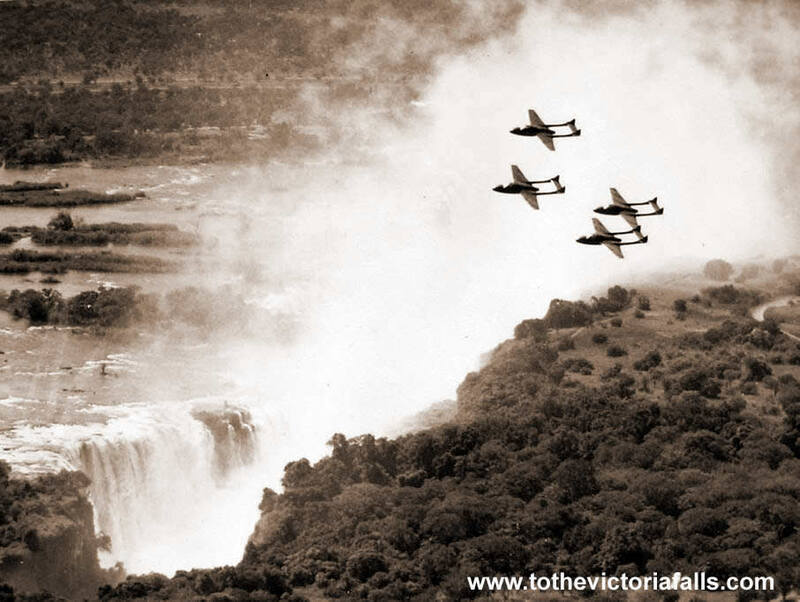 Through the 1950s Victoria Falls Airways operated tourism flights from the Victoria Falls Airfield on the south bank, now boasting a hard surface runway of 800 yards (730 m). The parent company, Air Carriers Ltd, continued to grow with the acquisition of smaller charter companies, ultimately resulting in the formation of Rhodesia United Air Carriers (RUAC) in 1957. In January 1955 a freak storm destroyed the hanger, two de Havilland Rapides and damaged several other aircraft. Six months later the company was back up and flying. 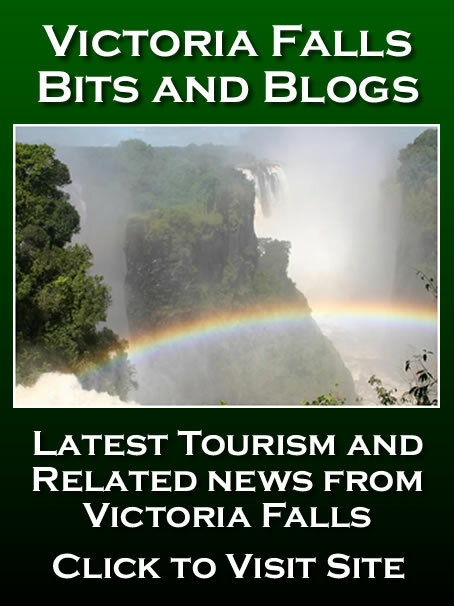 Changes on the south bank in 1952 amalgamated the Victoria Falls Reserve, including the Special Area immediately around the Falls, with the larger Victoria Falls Game Reserve, covering an area upstream of the Falls, to form the expanded Victoria Falls National Park under Proclamation 25 (1952) of the National Parks Act (1949). The protected area covered 60,000 hectares, with the town of Victoria Falls an excluded enclave, surrounded by the National Park. The main road to Kazungula in neighbouring Botswana bisects the Park in two halves. 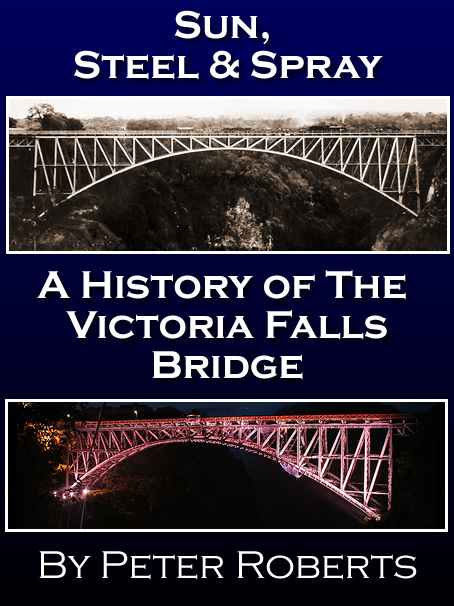 The Special Area of the Falls, including the river sections immediately above and below the Falls, was now effectively under the shared control of both the National Park Advisory Board (NPAB) and the Commission for the Preservation of Natural and Historical Monuments and Relics. Under the management of the NPAB tourism infrastructure and services on the south bank were developed, including the Rest Camp and Zambezi Camp, providing flexible accommodation options for independent travellers. The Zambezi Camp was developed from the abandoned BOAC offices and staff residence for the short-lived flying-boat service. A riverside drive was established running upstream along the scenic stretches of the Zambezi that had so enchanted Livingstone. 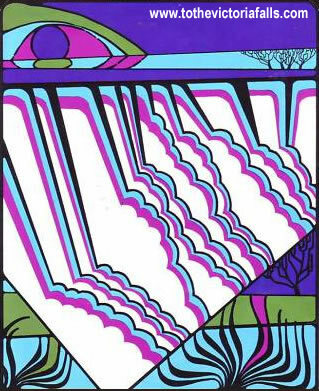 The Sprayview Restaurant was owned and operated for many years by Mrs Green.